How romantic to hold your wedding ceremony outside! All you need is a lovely garden, village green or indeed a wood - and, ideally, a Plan B. Flowers in the garden need to be big, bold and robust to hold their own both visually and to physically stand up to the various types of weather - be it bright sunshine, drying wind or a downpour. They must look very natural too to stay in keeping with their surroundings. I was delighted to be involved with 4 outdoor weddings in 2016 throughout the summer - one in each of May, June, July and August. For the florist, garden weddings involve an early morning flurry of activity as arches are adorned, swags hung, and lights and candles dotted about the place to illuminate the evening party. As for the Plan B: you ideally need an alternative space, and lots of umbrellas on hand! And yes, one of the four did make use of their indoor space for a part of the day until the sun came out again. This year the dry autumn has encouraged me to dig up my dahlia patch for some reorganisation and rejuvenation. The zinnias have loved the hot dry weather we have had this August and early September. They are half hardy annuals and dislike being transplanted so they are generally the last thing which I sow each spring. I do not direct sow (which is often recommended) but the seeds germinate very quickly so if sown at the end of May and quickly moved into their final growing space they should thrive. A couple of very sunny days in and around Amsterdam worshiping the tulip. From the Hortus Bulborum where ancient types are still preserved by a team of volunteers, to the futuristic looking flower auctions in Aalsmeer. I thought that I was prepared for the extraordinary excesses of the Kerkenhof display gardens - but in fact still found them to be overwhelming and inspiring in a way that I had not expected. The beautiful park like setting with the sun shining through the emerging leaves of the mature trees somehow allows beds bursting with nothing but bulbs to avoid being vulgar. 4 million bulbs are planted every year and it is a wonderful showcase for the bulb growers. Spending so much time outside means that we see a lot of wildlife. Every morning we walk past the pond on the way to the yard where the flowers are. It is a draw for all sorts of things – ducks and moorhens, an occasional heron, very occasionally blue flash of a kingfisher, frogs, newts, grass snakes and fish. Not to mention the adorable water voles plopping into the water from their holes on the bank. Two beasts, in fact: a pair of climbing 'Etoile de Hollande' roses growing either side of the garden door and arching over the top. It's a beautiful but brutish rose with deliciously scented, voluptuous red blooms which flower quite early and then sporadically through the summer. Its most frustrating habit is sending up huge new shoots early in the year, only to snap off at the whiff of a bit of string to tie them in... Tackling it is one of those jobs that has to be done when in the right mood, preferably with the sun on my back, as today, and with the scent wafting up from the sarcococca below. I spent all afternoon battling and cajoling it into shape. The effect over the door and windows is just as I planned all those years ago, and it also keeps the rather hobbit like door in proportion with the rest of the house. The roses which we grow in the field solely for picking are pruned in stages. The idea is to spread out the flowering period. The first flush will be in June but the hybrid teas repeat all summer and the picking encourages new growth. The picture below is from last June. t is good to remember that many favourite plants are quite capable of growing themselves, although not necessarily where you might choose to sow them. In fact, the ammi majus are making their point by popping up between the cracks in the paving. This week I have ordered some more dahlias. I cannot resist trying some new types so I ruthlessly got rid of a few - least favourite - in October to make way. That and looking through old photos, and finding this one of Harry modelling a whopper dahlia 'Ice cube' has been a very good cheering up exercise. I use the very reliable Rose Cottage Plants, based in Essex. Witheypitts Dahlias in Sussex are another excellent supplier. I had tried growing cleomes before, but when I saw them towering in the productive walled kitchen garden at Rousham last September it felt like a challenge. They are not entirely straight forward to germinate - although they are happy to seed themselves about in the right garden - so they spent a couple of weeks in the fridge ("have you made a chocolate pudding?" my children asked), before going back into the greenhouse, and onwards. The seeds should be on the surface of the compost and ideally in individual cells. I was, eventually, rewarded with nearly 100% success, and was able to give a few away. In retrospect - and as with so many half hardies - it might have been easier to have waited until April when there is more light. I bought the seed from the wonderful Higgledy Garden. Pinch out the main stem! This is where I went wrong pre Rousham. 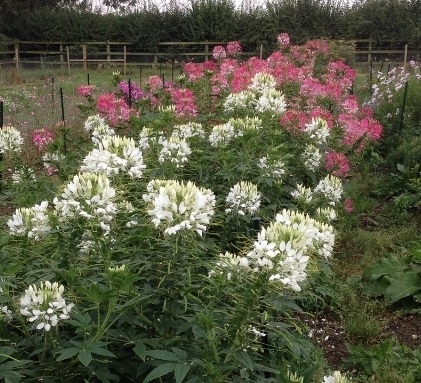 I have used Cleome 'Helen Campbell' (white), Pink Queen, and Violet Queen constantly all summer. They are fantastic for hand tied bouquets, somehow airy but substantial at the same time, and for getting some really good height in a large pedestal arrangement. BUT.... those thorns. They really are sharp and removing them adds some time to the whole process. Bees love the flowers so watch out for them if picking. And on the subject of wildlife, slugs find them delicious whilst young, despite those thorns. Back in February I received an email: 'would any members of Flowers from the Farm be interested in putting on a display at RHS Hampton Court Flower Show?' and so, in the spirit of saying YES, off I went to meet 5 fellow members of FftF at the RHS Spring Show in London, along with Dave Green who runs Hampton Court Flower Show. The RHS were very interested in our efforts to promote British-grown, cut flowers, and we were invited to have a stand in the Rose and Floristry Marquee, 3m square with a theme of 'Circus'. We quickly shared out the various roles with Emily Rae - Plants for Presents - in overall charge, Martin Beker - Martin and the Magpie - designing the stand, Fiona Hesketh - Purple Daisy Flowers - would make a rota of attendants, Shiela Hume - Blue Hen Flowers - and Cel Robertson - Forever Green Flower Co - would cover press releases, and I would collate the flowers from the various members of FftF who had expressed an interest in being involved. I received promises of flowers - which at that stage were probably still seeds in a packet - from optimistic flower growers all round the country. Martin worked out a design and calculated how many flowers we would need. A chance conversation led me to Jo Hammond of Twigweave Willow who very generously took on the challenge of creating a willow horse. Meanwhile Julie Clark of Hillcrest Nurseries offered the services of her husband David and his jigsaw to create the beautiful Romany wagon. Very many emails later.... we arrived at the Hampton Court site last Sunday to bring the plans to life. Some, but not all, of us got to meet each other in person at last. Flowers were delivered in a continuous flow during the week to allow for the heat inside the marquee. We had an amazingly enthusiastic response from the organisers and the public.... there is already talk of 2015.